A few weeks ago I posted a survey, asking you guys to give me some feedback about Merrick’s Art. Your answers, comments, and feedback have been so fun to read through (and I’ll be closing it up at the end of this week, so go enter to win $100 to Nordstrom if you haven’t filled it out already). One of the most asked questions in the survey about looking put together as a mom of little kids. Where do I find the time to get dressed and take care of myself every day? I love this question, because making it a priority to get ready and take care of myself pretty much every day makes me feel better about myself, which makes me a happier and better mom. So today I’m teaming up with Nordstrom to share the ways I make time to get ready and take care of myself. Working from home, three little kids, a husband who works long hours, church and family and home responsibilities — there’s a lot on my plate at this stage of my life. But these are a few things that definitely help things run more smoothly for me. 1. Shower at night. Not only does it cut down on my morning routine, but it also helps me sleep better and wind down at the end of the night. I’ve been doing this for a few years and it’s the best thing ever. As for exercising, I mentioned here that I took an accidental year long break from exercising, but I’m hoping back on the wagon with the new year and plan to exercise in the evenings so I can shower right afterward. 2. Get up earlier than your kids. I am not a morning person, and with our move, our school time now starts 45 minutes earlier. So I’m up way earlier than I’d like to be, but I still make the effort everyday to get up thirty minutes before it’s time to go downstairs. This gives me time to get up, get dressed, do my makeup, do my hair, and then get downstairs for breakfast. Then when I get home from school drop off I’m completely ready for the day and ready to dive into our routine (or I can go straight from drop off to run errands and then come home and be completely ready). Also, I know some of you have crazy early riser children. I have to wake my kids up at 7am to get ready for school, so I can get up before them. But if your kids are early risers, teach them to tell time and then make a deal with them that they have to stay in their room and play or read until a designated time. This is what we do on the weekends so Philip and I can get a little sleep in! 3. Do as much the night before as possible. In our home, I make dinner and Philip does the dishes. While he’s cleaning, I hang around in the kitchen talking to him, and while I’m in there I pack the boys’ lunches and then stick them in the fridge for the night. I also choose my outfit for the next day, and choose and lay out their outfits. Everything that cuts down on morning time is worth it! 4. Choose clothes for yourself and for them that are comfortable, easy to throw on, and make you feel cute. No matter how prepared I want to be, some days are just rushed and I haven’t prepped clothes and lunches and everything else. 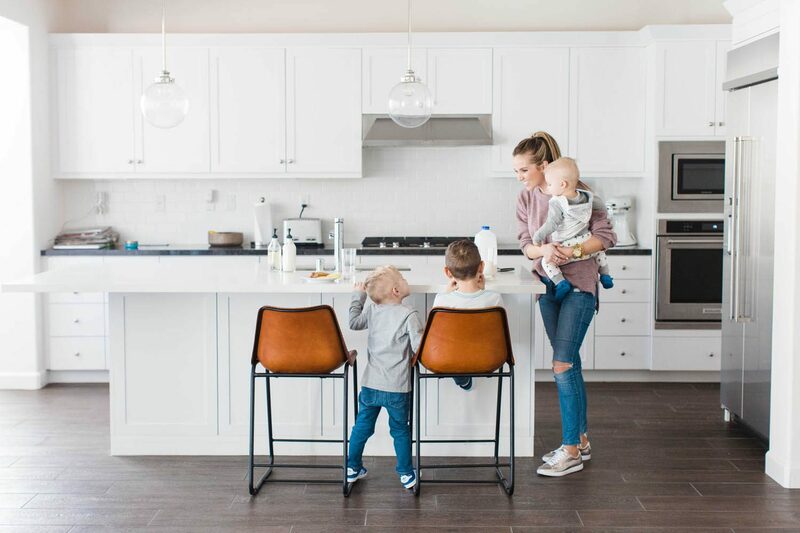 One of my solutions is to create both closets for my kids and a momiform wardrobe with pieces that are comfortable, easy to throw on at a moments notice, and make us feel put together with little to no thought. For me, my no brainer outfit consists of jeans and an oversized sweater, like this gorgeous lavender one from TopShop. 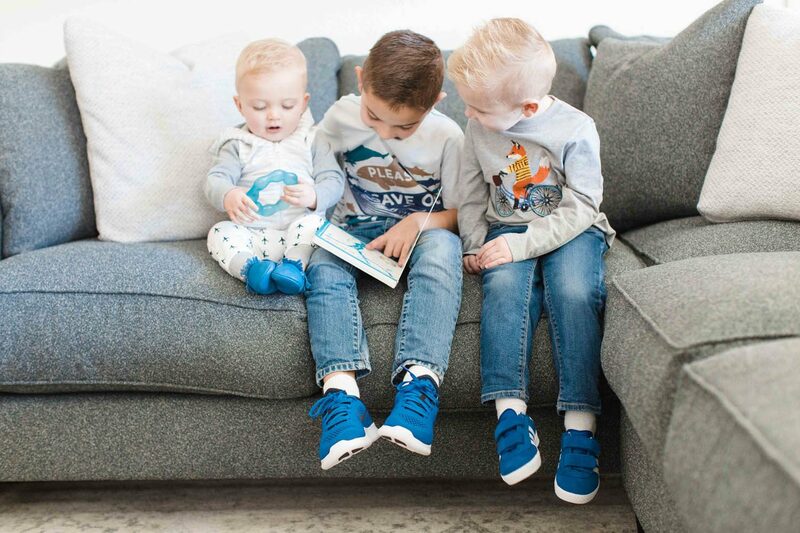 For the big boys, it’s t-shirts, comfy jeans, and shoes that make them run “super fast.” And for the baby, it’s all about soft, stretchy, cozy pieces he can wear during the day and look cute, but also can be comfortable in during nap time. Nordstrom is my go-to for a lot of the clothing my closet, and their selection of kids clothes is also amazing. 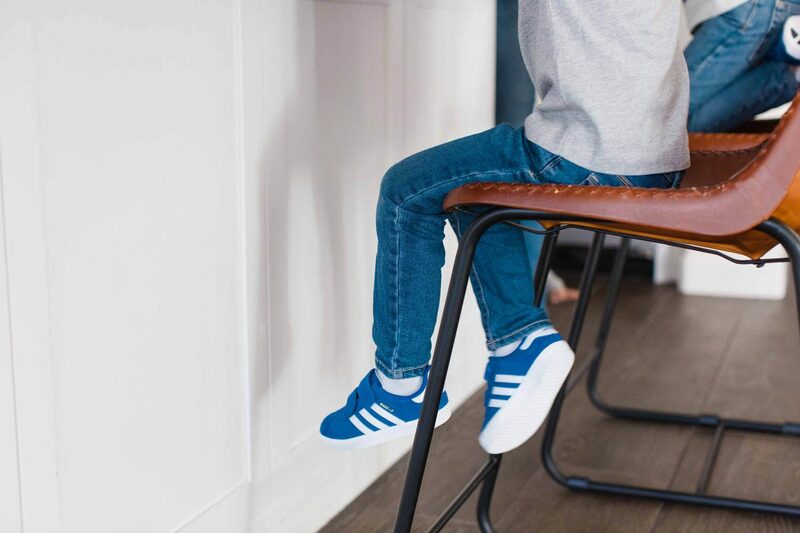 I love buying my kid’s shoes from Nordstrom because they have great brands that are durable, plus they have the best selection of colors and styles in those brands. 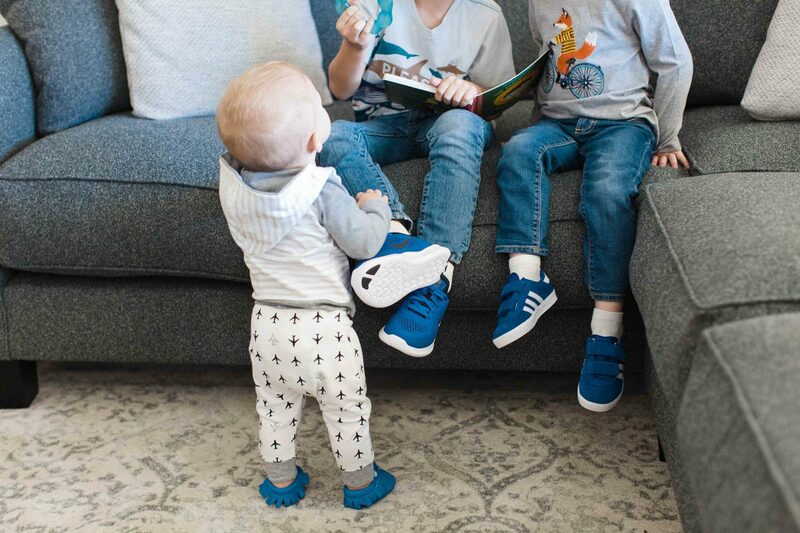 I’m obsessed with these cobalt Nike’s and Adidas I got for my boys! Plus I love that if anything happens to the shoes, you can bring them in and replace them! 5. Remember that taking care of yourself makes you better. This is the reason I get ready in the morning. I don’t ever let myself forget this because it’s essential. If you’re comfortable, put together, and taken care of, you’ll feel more confident and happy, which makes you a better mom. It’s worth the extra effort to take care of the little things so you have more time and attention for the big things. Those kids of yours deserve your very best self, so take the time for YOU and for THEM. I love that their shoes are all the same color! So cute! I so agree! Showering at night, getting up before my kids and having cute but comfortable and easy clothes for me makes all the difference in my attitude for the day! I love all of your tips! These are a lot of things that we already do, but next year both our kids start school and we’ll have to start the early wake-up and I’m not looking forward to it! I also like these tips! However, I wake up with crazy bed head even when I don’t shower before bed. How do you make yourself look fresh in the morning without showering? Loved the post! Such great tips! 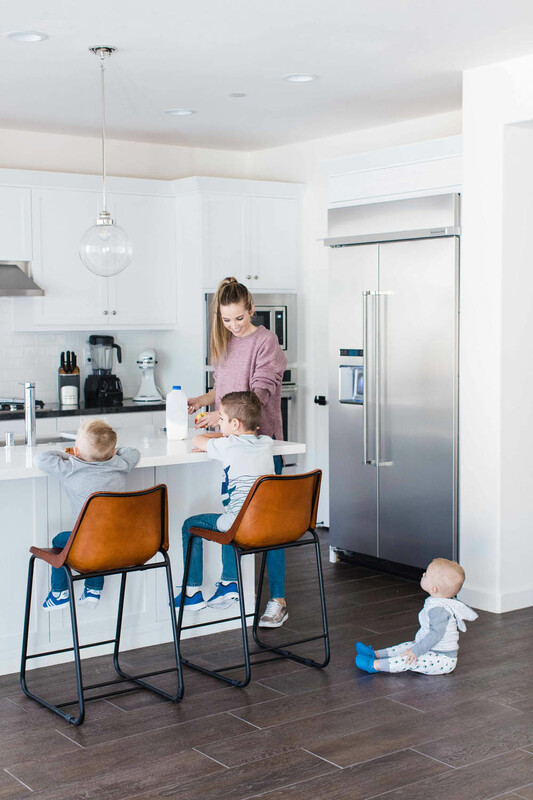 Of course, now I’m wondering about your night routine, especially for your boys–how do you find time to exercise in the evening with 3 little boys? Obviously I’m not Merrick, but I’ve been (I AM) in the same position as you. My oldest son is 3 years old and I have an 8 month old boy as well. Luckily my second is an easy baby and mostly sleeps through the night but my first was a horrible sleeper! Sometimes I went an entire week without a shower because I just couldn’t spare those few special quiet minutes I got to nap throughout a 24 hrs circle. The thing is, I got really depressed that way. You feel tired, and ugly and dirty and just overall like a failure. I think Merrick has a point when she says that taking a few minutes for yourself makes you a happier and therefore better Mom. I started with super simple steps, like making it a point to brush my hair, before I put it in the usual messy bun. Or brushing my teeth first thing in the morning and not waiting until I had time to “start my day”. 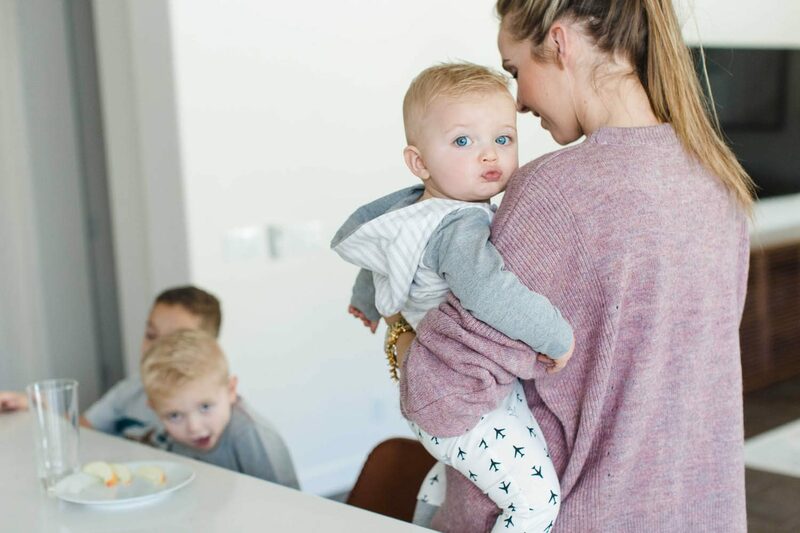 The fact is that your baby will learn to sleep through the night and you will get your life back under control (as much as that is possible with kids) and you’ll find that new routine much quicker if you take tiny steps along the way. Sorry if this is a way too detailed answer. But a few years ago I wished someone would have given me some advise like that. I thought I had to have it all together or at least look the part. But you don’t have to. And I’m sure you’re beautiful, even with a messy bun, stained clothes and dark under eye circles. But making an effort for yourself everyday makes a huge difference for your emotional health! Off topic, but what’s the source on your living room rug? It’s just what I’ve been looking for. Thanks! This was a wonderful post. Love your insight, Merrick!